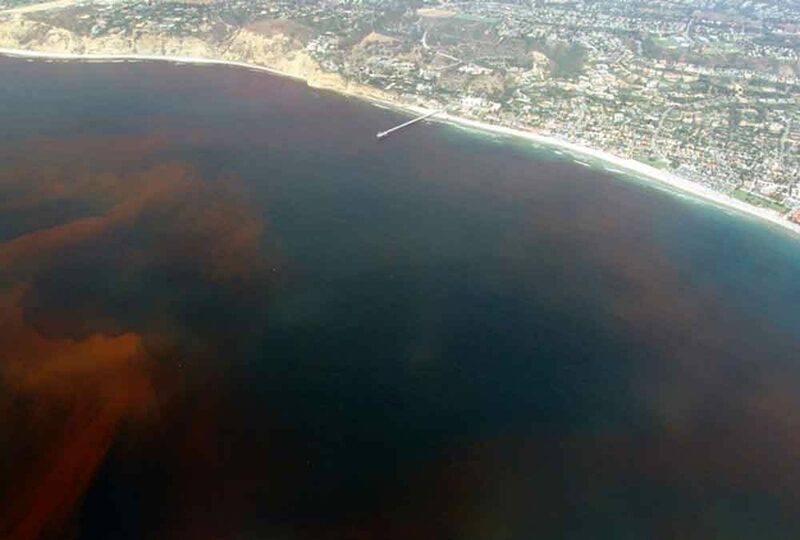 Red tide is a condition that usually occurs during the summer months in Southern California and is characterized by plumes of brownish-red water that drift up and down the coast with the ocean currents. A red tide is caused by a “bloom” of microscopic, red algae. Red tide can cover a large area and turn entire beaches red and murky. An odor of decay in the water commonly accompanies a red tide. This is caused by decaying organic matter in the water such as kelp, plankton, and fish which die because the red alga starves the water of oxygen and light. Red tide is not generally dangerous but can cause certain respitory irritations in some people such as surfers and ocean swimmers who breathe the air close to the surface of the water. Red tide also contributes to levels of toxicity in shellfish, which filter the ocean water through their bodies to feed on microscopic ocean life. One spectacular event that takes place in the ocean during red tide is the greenish glow of phosphorescence. The bloom of red algae is accompanied by an increase in microscopic plankton called dynoflagellates, which glow in the dark when disturbed by currents or waves. The result is a brilliant light show of turquoise glowing waves as they break along the shoreline at night.